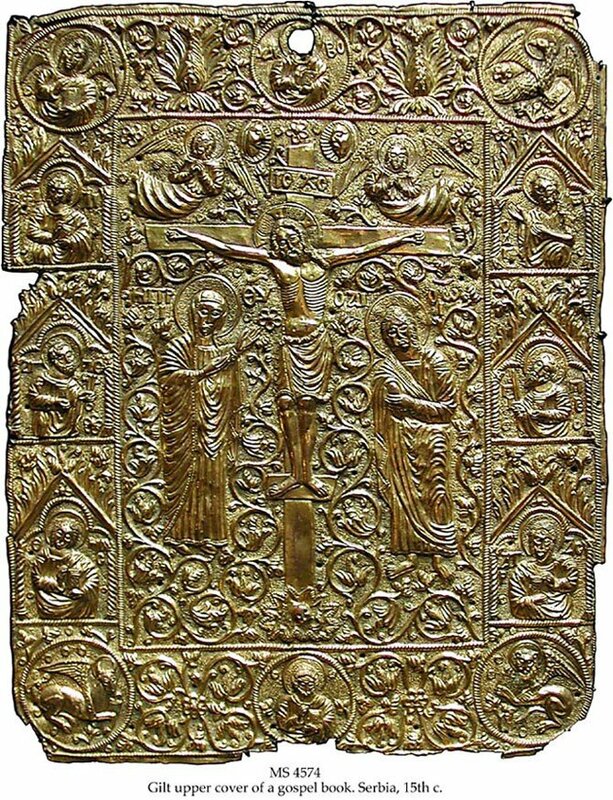 Description	 Copper gilt upper cover of a gospel book in central panel the Crucifixion, with Christ flanked by the Virgin and St. John. 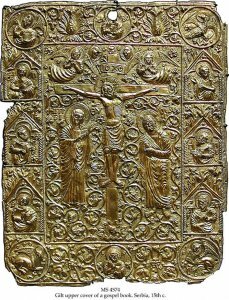 Binding	 Serbia, 15th c., copper gilt upper cover of a gospel book, 31x24 cm, in central panel the Crucifixion, with Christ flanked by the Virgin and St. John; above the cross symbolic representations of the Sun and Moon between 2 angels. The symbols of the Evangelists, with individualised faces and postures occupy the 4 corners. The outer panels niches contain: James top centre, Sts Philip, Peter and Thomas on the left, John the Baptist, Paul and Andrew on the right, the resurrected Christ bottom centre. Provenance	 1. Monastic or princely commission, Serbia (15th c.); 2. Private icon collection, Germany (-2000); 3. . Sam Fogg Rare Books Ltd., London. Deaccession October 2010. The workmanship and gilding are of very finest quality, - perhaps even more remarkable is the splendid way in which the surge of vitality in western art, which characterised the Renaissance, is here married to the living traditions of Byzantium and the Orthodox Church. The ivy-leaves can be compared with those on a flabellum now at the Monastery of Banja, near Priboj, and also with the decoration of a silver bowl at Pristina. The drapery folds are executed very much in the 15th c. style, proving the respect for traditional forms in Serbian art. As the triumphant Turks swept through eastern Europe following the fall of Constantinople (1453), painter and craftsmen fled before them, many finding their way to the Ionian Isles and the territories of the Dalmatian coast which Venezia had taken from the Byzantine Empire many years earlier. The resulting Italian influence on their work is familiar through the beautiful icons of the Reto-Venetian School. This book cover shows the extent to which craftsmen in metal were able to combine the best of both worlds. The classic Byzantine style of the intricate background of stylised foliage is given a new richness by the "gothic" feel of features such as the spiralling flow of the robes of the angels above the cross, and the form of the niches which contain the figures in the margins. The use of gilt on copper, effectively unknown in Byzantium for such artefacts, may well reflect the attractions of newly learnt western techniques as much as a need to reduce cost. The fact that the bust of James, from which the head is missing, perhaps deliberately defaced, has been given pride of place at the centre of the top margin raises interesting possibilities. James was, supposedly, the author of the important apocrypha known as the Protoevangelium of James which tells the story of the early lives of the Virgin and Christ. 3 of the principal feasts of Orthodoxy - the Birth of the Virgin, Her Presentation in the Temple, and the Nativity - derive their settings from the Protoevangelium. It may be that the writings contained in this cover included the Protoevangelium, and that it was the cover of a volume kept with the "secret books" of a monastery. This would account for its having been carefully preserved and relatively little handled. See also	 MS 034, Painted panel by Cozzarelli, Siena, mid 15th c.